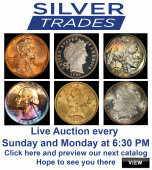 STARTING TONIGHT AT LOT 390, ABOUT 300 Lots of Fabulous Numismatics; incl Morgans, Peace $'s, Lg cents, ½ cents, Indian cents, Bust coinage, NGC/PCGS Slabs, Vam's, Mint Error’s, Varieties & More. Just to Reiterate from our terms and conditions: I do my best to estimate the grade/condition of the coins, but please note, unless specifically mentioned in the descrip...moretion, I do not guarantee grade or condition. I DO ALWAYS GUARANTEE 100% AUTHENTICITY, on an immediate buyback including any premium paid. But please understand, if you win a coin and receive it and send it out to one of the grading companies and it comes back graded less than I estimated or "genuine but Ungradeable", we will not buy back that coin. No refunds will be issued. Please understand this and look at the large pictures and make your own decision on the grade/condition. I do my best to give you my best estimate and your repeat attendance at my auctions is what I strive for, so I always attempt to give my best description/estimate of the coins being auctioned. 1981 United States Mint Set in the original packaging. The 1981 sets include a Susan B. Anthony dollar, Kennedy half, Washington quarter, Roosevelt dime, Jefferson...more nickel & Lincoln cent, 1 coin each from both the Philadelphia and Denver Mints. Plus a San Francisco “S” SBA Anthony dollar. The 1981 SBA Dollars were never released for circulation, they were only available in these mint sets. 1964 Proof Set Original Packaging Including Mint Letter. This is for a 1964 Proof Set. The set, has a 90% Proof Kennedy Half Dollar, a 90% Proof Silver Quarter, a...more 90% Proof Silver Dime plus the proof nickel and proof penny. All in the Original Packaging including The Mint "Memo". You've been outbid to 1****o! to YOU! 2005 United States Mint Silver Proof Set - 11 pc set, about 1 1/2 ounces of pure silver. The Set contains 5 90% Silver Proof State Quarters, a 90% Silver Proof Hal...moref Dollar, a 90% Silver Proof Dime, as well as 4 additional Proof coins Including the Sacagawea Proof Dollar coin. Complete with Original Packaging and COA. Note* The set contains about 1 1/2 Ounces of Pure Silver. You've been outbid to w****o! to YOU! You've been outbid to V****6! to YOU! Rare sealed 1980 Susan B. Anthony Dollar Souvenir Set, including all 3 mints, P, D & S. Up for auction is a Sealed 1980 Susan B Anthony uncirculated souvenir coin...more set. The Susan B. Anthony Coin Act was signed into law by President Carter in October 1978, to honor the famous woman who devoted her life to leading the women's suffrage movement in the 19th century. Introduced by the U. S. Mint in 1979, the coin was short lived; struck only in the years 1979, 1980, 1981, and then once again after an eighteen year absence in 1999. This three coin souvenir set includes one 1980 issue dollar coin from each of the following mints: Philadelpia, Denver, and San Francisco. The obverse features the lifelike portrait of Susan B. Anthony, the reverse depicts an American eagle landing on the Moon, talons wrapped around an olive branch, an adaptation of the famous Apollo 11 insignia; the same design previously struck onto the Eisenhower Dollar. The uncirculated 1980 Susan B. Anthony Dollar Souvenir Set is presented in the Original Mint Packaging. The coins, in GEM BU condition, exhibit a superb strike with excellent eye appeal. 1963 Proof Set in original mint packaging including Mint Letter. The set, has a 90% Proof Silver Franklin Half Dollar, a 90% Proof Silver Quarter, a 90% Proof Silv...moreer Dime, 2 Other Proof Coins, all in the Original Packaging with the envelope and The Mint "Memo". All 5 coins grade Gem Proof+ or better. You've been outbid to V****7! to YOU! 2003 United States Mint Silver Proof Set - 11 pc set, about 1 1/2 ounces of pure silver. The Set contains 5 90% Silver Proof State Quarters, a 90% Silver Proof Hal...moref Dollar, a 90% Silver Proof Dime, as well as 4 additional Proof coins Including the Sacagawea Proof Dollar coin. Complete with Original Packaging and COA. Note* The set contains about 1 1/2 Ounces of Pure Silver.